Describe one way of life in your country that has been changed and why it is beneficial. In my country, the way of entertainment has been changed dramatically during the past decades. For my grandparents, as far as I know, they can either do some needlework or listen to radio in their spare time. For my parents, they enjoyed much more fun with the popularity of telephone and television among households. For my generation, with plenty of choices out there, it even takes time to think about which way to entertain us. Variety is the spice of life. The variety of entertainment brings joys and laughter to our lives, adding color to our dull routine and relieving our stress in this modern world. Do you prefer to start work in advance or on due day? I always prefer to start work as soon as possible. First of all, it makes me feel well-organized. Even if I have other works to do, I would not get stressful or into panic. Besides, it gives me more confidence. I used to freak out in every single exam. Early start allows me to get better prepared and saves me the trouble of burning the midnight oil. Lastly, it leaves me time to handle emergencies. For example, I once wrote an essay for my history class with my laptop. Unluckily, the laptop broke down when I was about to finish. So I had to rewrite my essay all over again. It was frustrating. Well, I cannot imagine how I would feel if this happened on due day. The reading passage tells us that the university requires the new students to participate in the study group. However, the woman in the dialogue disagrees. She gives two reasons for her idea. First, she thinks that many of the new students have already acquired some learning skills, so it would be a waste of time for them to take part in the discussion group. Second, she thinks that the students will become friends sooner or later, because they study in the same class. So it is unnecessary for them to make friends with each other in the discussion group. The reading passage discusses animals’ own way to maintain them. The listening passage is a lecture delivered by a professor on the same topic. According to the reading passage, sometimes animals keep the same size to defend themselves from outer threats. Sometimes they adjust their size to obtain certain resources. 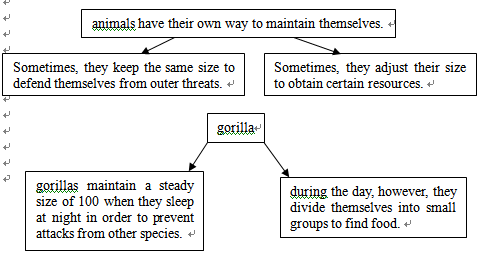 In the lecture, the professor illustrates the whole idea with the example of gorillas. Gorillas maintain a steady size of 100 when they sleep at night so as to prevent attacks from other species. During the day, however, gorillas divide themselves into small groups to find food. In this way, they can maintain themselves well. 1. Keep working in the bookstore as a cashier. 2. Wash dishes in the cafeteria. The man in the conversation has a problem. He used to work in a bookstore, in charge of carrying heavy books to the shelves. One day, he hurt his back when removing to other places, so he wants to change his job. The woman gives him two suggestions. First, he may keep working in that bookstore as a cashier instead of carrier. Second, he may switch his job to wash dishes in the cafeteria with less money. In my view, I prefer the first solution for two simple reasons. Needless to say, he can obtain the same salary by working in that bookstore. Besides, it is less exhausting to work as a cashier, which is good for his backache. Lastly, he may rearrange his time for study. In the lecture, the professor demonstrates two ways to maintain social stability. First, people around the world work on jobs of the same type. In this way, they may share the same schedule, the same focus and the same interest, which is good for maintaining social stability. Second, people work on different types of job, which is known to us as “division of labor”. In this way, each individual makes their own distinctive contributions to the world. They heavily rely on each other for goods or services, which is also beneficial for maintaining social stability.